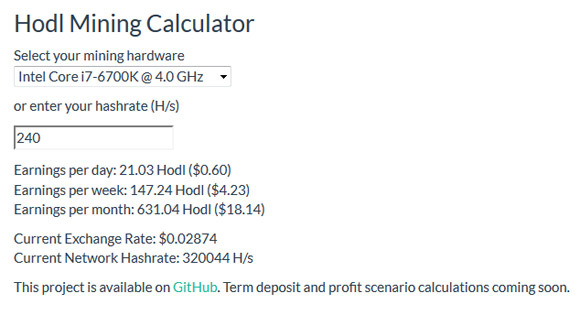 There is now a mining calculator available for HOdlcoin (HODL) our current favorite for a CPU-only mineable crypto coin. The calculator makes it easy to get a good idea on how much you might be able to earn using your CPU for mining the coin. The calculator gives you only information about what you can mine, but your profit can increase significantly thanks to the interest you get and if you deposit the coins for a term, taking advantage of the still quite high interest rate. Another interesting new feature with HODL is the recent introduction of a custom HOdlcoin block explorer that gives interesting and useful information on how things are moving with the coin and its network, so do check that out as well.